This clinic operates under a SLIDING SCALE model. This means that it MAY NOT be free depending on your income. You will be required to prove financial need in order to receive free services or services at a reduced cost. This is a health care center funded by the federal government. This means even if you have no insurance you can be covered. The center is also income based for those making an income. This health center can cover services such as checkups, treatment, pregnancy care (where applicable), immunizations and child care (where applicable), prescription medicine and mental and substance abuse where applicable. Contact them at the number provided for full details. Blythe Health Clinic - Riverside County Health Department is a Community Health Center. In order to get more information on this clinic, click on the icons below. You may be required to join for free in order to access full contact information. Many children, families and adults in Riverside County may quality for low-cost or no-cost health and dental insurance. To get these county, state and federal sponsored medical programs is based on income and family size. These payment methods are accepted at all of our Riverside County Family Health Centers. Choose a Payment Method below for more information. Patients who do not have health insurance coverage, may qualify for the County of Riverside Ability to Pay Sliding Fee program. To qualify, you must present proof of family income in order to receive the Sliding Fee Scale discount; the level of income will determine how much of a discount you will receive; a minimum of $35.00 for returning patients or a minimum of $ 50.00 for new patients. Patients who have Medicare, Medi-Cal or other coverage, please see appropriate section. Most services are eligible to receive a sliding fee scale discount, with the exception of prenatal, adult immunizations, pre-employment/training physicals, school physicals, and health screenings for foster parents. 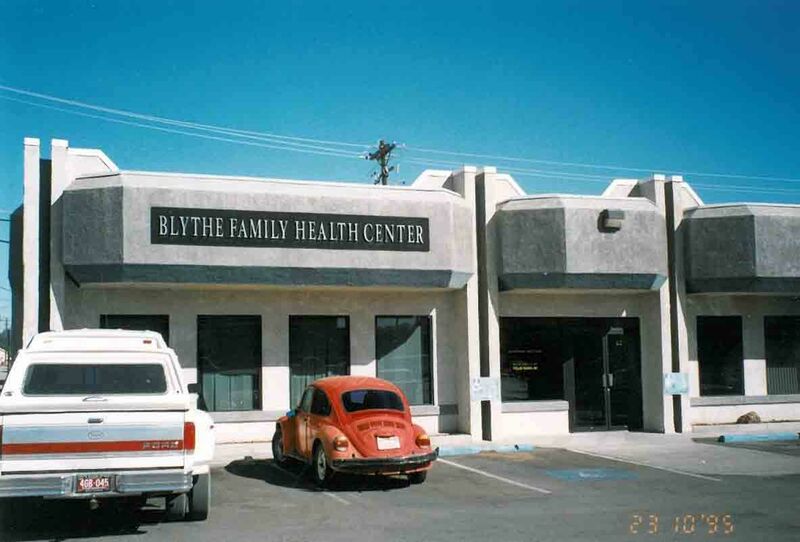 For more information, please call your local Family Care Center..
Blythe Health Clinic is located on Hobson Way in Blythe, CA offering medical services and a broad range of health services for both adults and children. Competent, timely, family-centered care, emphasizing preventive strategies, characterize our mission. The purpose of Clinicas de Salud del Pueblo is to provide direct access to comprehensive quality primary and preventive health care for high risk and other underserved valley residents, in a manner consistent with their dignity and identity and at a reasonable cost through strategically situated health centers. Are you familiar with Blythe Health Clinic - Riverside County Health Department? Help Freeclinics.com users find out answers. Blythe Health Clinic - Riverside County Health Department is a Community Health Center. Have you visited Blythe Health Clinic - Riverside County Health Department before? Let our users know, some cost details! Attention We cannot guarantee the clinic costs to be completely accurate. Costs are displayed for informational purposes for our users. We have compiled prices provided by users and online research. In order to obtain actual costs please contact Blythe Health Clinic - Riverside County Health Department directly.